Not many people think that Crocodiles need protection but the African slender snouted crocodile is critically endangered and in real danger of extinction. Its all in the news how the Rhinos are being poached for their medicinal horns but no one really understand or talks about important work Zoos do. 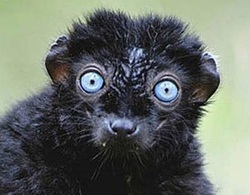 The blue eyed black lemur is among the world’s rarest and most endangered primates. There has been an 80% population decrease of this species.